Me: Hi babe! Where are the socket wrenches? Me: I just need them for something I’m doing. DTH: What are you doing? Who is with you? Me: It’s a surprise. I have adult supervision. DTH: Is the adult supervision your mom? Me: So where can I find the socket wrenches? Me: Oh! Found them! Thanks, babe, see you later! DTH: What do you need them for? DTH: Babe? Hey! What are you using them for? When Davey purchased a mandolin a couple weeks ago, I was under (and still am) very, very strict orders not to touch it, because I would probably very accidentally shave a finger off trying to create fancy crafts or somesuch. But. He can use it, and he is masterful with it and cranked out the below dish that we served for our annual family Christmas dinner. If you don’t have a mandolin, I’m not really sure what to tell you to do here. I would probably get a very large knife and try to cut very thin slices, and again would complete the project with fewer fingers. I would probably then realize I should have used a setting on my food processor, so maybe start there. Preheat oven to 375. Combine cream, thyme, and desired measurement of salt and pepper (you want your cream to taste salted). Drizzle small amount into bottom of a 9″ x 11″ casserole dish, lightly coating the bottom. On top of cream, layer sweet potato rounds, fully covering surface area. Next, layer parsnips strips, fully covering sweet potatoes. Follow with carrots, fully covering the parsnips. 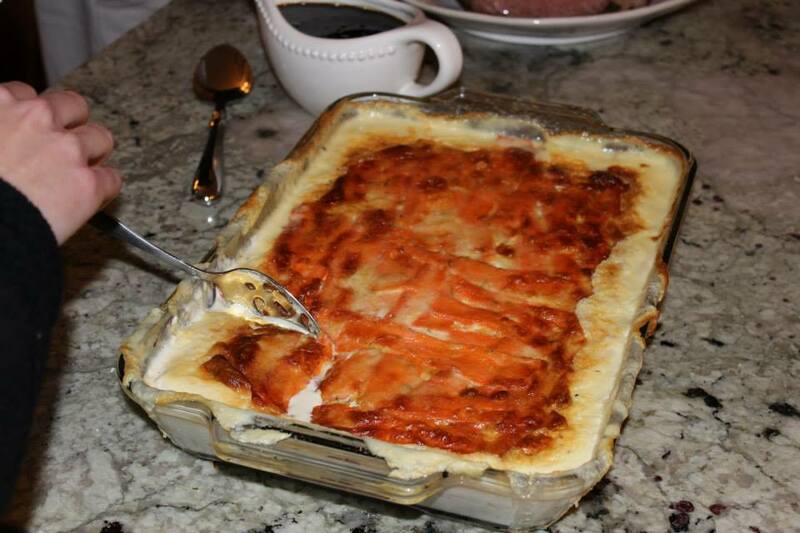 Cover layer of carrots with cream then sprinkle on a generous amount of parmesan cheese. Begin your layers again on top of the cheese. Sweet potatoes, parsnips, carrots. Cover with cream and parmesan. Add one more layer of sweet potato, cream and parmesan. Bake at 375 for 60-75 minutes. Gratin will be golden brown and bubbling.